*DISCLOSURE* Thank you to Penguin Random House for providing a copy of this book in order to facilitate this post. All thoughts are strictly my own. This is this second book I've read from this author and I must say, I am so impressed by her writing style! This chilling tale is absolutely gripping from beginning to end. The Broken Girls is a riveting page-turner that will have you on the edge of your seat. After reading it, I want to track down everything else Simone St. James has ever written...it's THAT good! 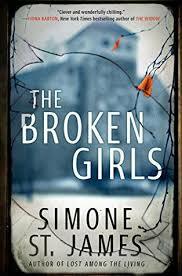 If you are a fan of suspense, you should definitely check out The Broken Girls.